The Year of Youth celebrates 10 years since World Youth Day was hosted in Sydney during 2008. It will focus on the theme Open New Horizons for Spreading Joy: Young People, Faith and Vocational Discernment. The emphasis is on local discussion and dialogue in parishes, schools, youth groups, and dioceses. Delivering the invitation yesterday Archbishop Denis Hart, President of the ACBC said: "In 2018, we want to engage with youth in new ways and they with us, helping young people to encounter God in Jesus Christ and his Church. Open your hearts to the life God intends for you and so make a real difference in the world." On behalf of the ACBC, Archbishop Hart said: "As Bishops we invite you, the youth of Australia, to open your hearts to Christ. You are deeply loved by Jesus and the Church. "We appreciate your gifts and contributions, and we want to journey with you. Young people have a great capacity to address injustice and create new opportunities for joy and hope. Today, many young people want to serve, and others are willing to take a chance to make the world a better place." 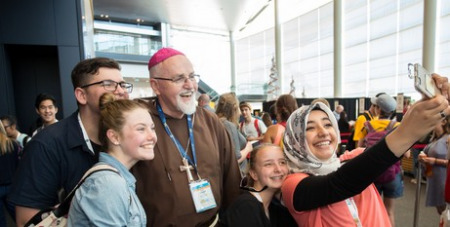 The Year of Youth will be part of a journey of dialogue and discernment as the Church in Australia contributes to the next Synod of Bishops in Rome during 2018 with its focus on "young People, Faith and Vocational Discernment" and as preparations commence to host a Plenary Council in Australia during 2020.